Regardless of age, we all want to feel our best, look our best, be our best self. To achieve this best self, we have to actively pursue optimal health. what happens with aging can actually help you slow the process! Weight Gain, Loss of Muscle Mass, Low Libido, Mood Swings, Fatigue, PMS, Anxiety, Irritability, Hair Loss, Sleep Disorders, Wrinkling and Thinning Skin. These conditions are often the result of hormonal imbalance starting as early as age 30. 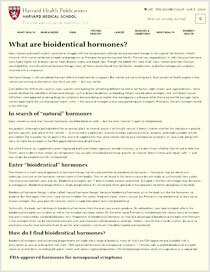 Such hormones include Estradiol, Progesterone, Testosterone, Cortisol and Thyroid hormones. Unfortunately it only takes the imbalance of one hormone to cause such symptoms. The good news is that we can help to diagnose and treat the hormone deficiency or excess and improve your imbalance with the bio identical hormone responsible for your symptoms. Replenishment of hormones to optimal levels has been shown to alleviate these age related changes. Gateway Aesthetic Institute is committed to guiding you along the path to optimal health. We monitor your progress through regular assessments of symptom relief, laboratory analysis and one-on-one consultation. Get started today with a personalized program to help you function and feel your best, while preventing age related decline in your health. With bioidentical hormone replacement, the focus is on a healthy quality of life, year after year. Give us a call today at (801) 595-1600 to schedule a consultation.